The Lower Modernisms – 053. Matchbook Delight! Part 13, The Kettle. October 5, 2013 by James Black. 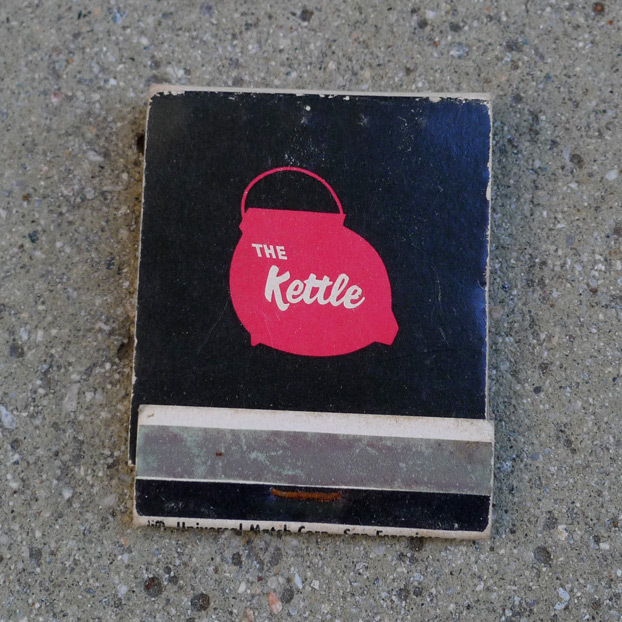 This matchbook for The Kettle shows another nice utilization of two-color printing. Gradients were not an option and thus the print technology encourages a flattening aesthetic – in this case, a traditional iron kettle is abstracted into a skewed shape that brings to mind a fat, cute animal, just the kind one likes to eat. Both the kettle and the letterforms are leaning over a bit, as though relaxed or maybe a little tipsy. The letters “THE” are slanted backwards feet-first, just like the kettle shape; but the word “Kettle,” in a custom script, leans forward and slopes down a bit. The choice of black and red seems to aim for supper-club nighttime sophistication, but the look is relaxed – lean back in our leatherette banquettes and put your feet up. The backside tells you the menu and the locations. 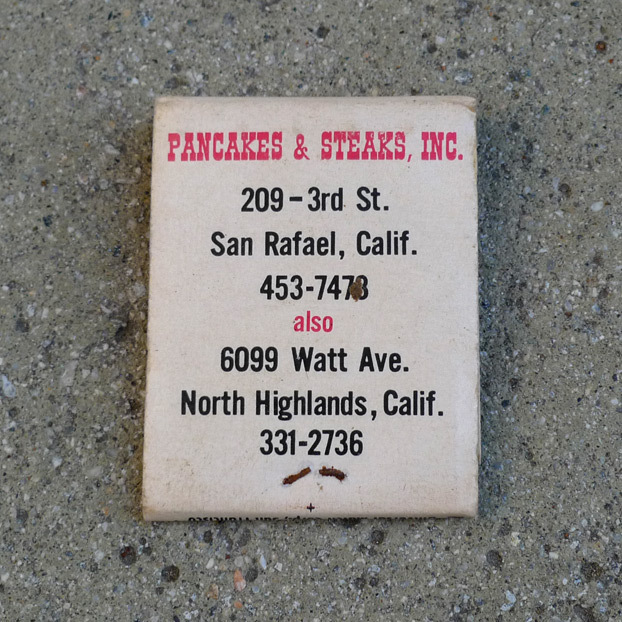 One might have been meant to read front to back and infer the phrase “The Kettle Pancakes & Steaks, Inc.,” but I would prefer to think that the Kettle was owned by an entity called “Pancakes & Steaks, Inc.,” which is a great name, especially in Wild-West slab-serif typeface. There are no hits on Google for that phrase, however, which is disappointing, because “Pancakes & Steaks, Inc.” kind of sums up everything I like about 20th-Century life in America. If I ever start a business, I may seek to incorporate under this name. 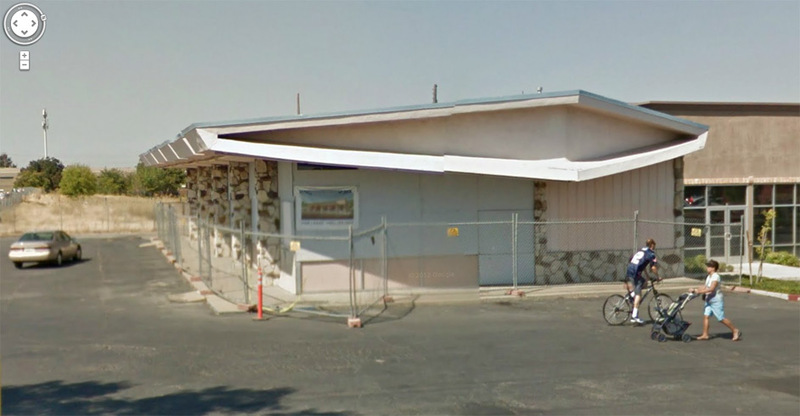 The San Rafael location appears long gone, but as revealed by Google Maps research, the North Highlands building is still standing at the edge of the massive parking lot of a much newer suburban strip mall. The Street View image above (complete with dubious scale figures) shows a pretty cool little building in the Googie style, its roofline culminating in a crooked, smiling mouth. Boarded-up and fenced-off, the former Kettle, which most recently was operated as a Check ‘N Go, is down on its luck and appears Endangered Lomo. There are signs of hope in Google’s newer aerial photography, however – the asphalt paving out front has been newly restriped and an accessible parking stall added, an encouraging sign of investment.